Digital artists are a new(ish) type of artist, stitching together pixels and creating images many enjoy, but rarely appreciate who created it or how it was done. For this new breed of talented composers, there are tools of the trade most of us use to help assemble our masterpieces. It's often a computer, Photoshop, and... a tablet, the contemporary paintbrush for us digital artist. While there are many types of tablets, one brand is universally heralded as the best and that's Wacom. Wacom has been supporting the movement for a long time having released the first gen Intuos line in 1998. Six generations later, we have their latest Intuos Pro line. As expected, every generation brings improvements in build, features, and design. The latest version can be highlighted by the new improved pen, 4x sensitivity, built-in bluetooth, and new "Texture Sheets"! This first gen Intuos Pro showing some signs of use and love. The smoothed shiny surface the result of heavy use. 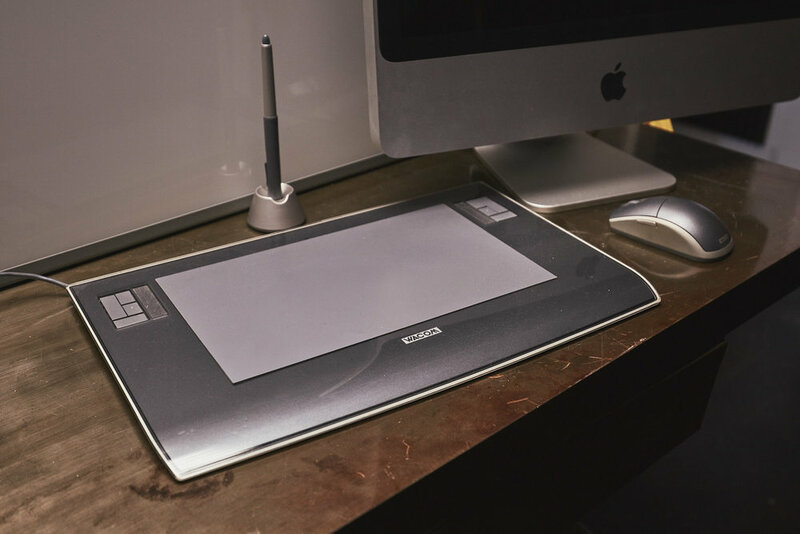 At RGG, we've been using Wacom tablets since the Intuos3 (shown above) and we're pretty amped about the updates. To help support the movement and to celebrate digital artist, we're teaming up with Wacom and Renee Robyn in giving away two new medium Intuos Pros. To enter is easy. No purchase is necessary and you have several ways to increase your chances. Follow the instructions in the app below for a chance to take home Wacom's new latest and greatest. Jake Hicks's Tutorial and Colored Gel Packs Giveaway! We're giving away 10 packs of Jake Hicks colored gel packs by Lee Filter and his upcoming tutorial on Colored Gel Portraiture!